For more than 30 years Tecnadyne has been a leader in the worldwide subsea robotics industry, manufacturing underwater brushless DC propulsion systems, rotary and linear actuators, pan and tilt positioners, hydraulic power units, position sensors and pressure compensators for use on remotely operated vehicles (ROV), autonomous underwater vehicles (AUV), manned submersibles and other subsea platforms. Many ROV manufacturers (including ECA Robotics, Deep Ocean Engineering, Outland Technology and Shark Marine, to name a few) use Tecnadyne thrusters on their vehicles. Tecnadyne products are presently being used on thousands of vehicles throughout the world, operated by many offshore oil service companies, universities and research institutions. Recent customers include Woods Hole Oceanographic Institute, Stanford University, University of Washington APL, Lockheed-Martin, Boeing, GE Nuclear, Oceaneering International, Mitsui Engineering & Shipbuilding, L-3 and Electric Boat. 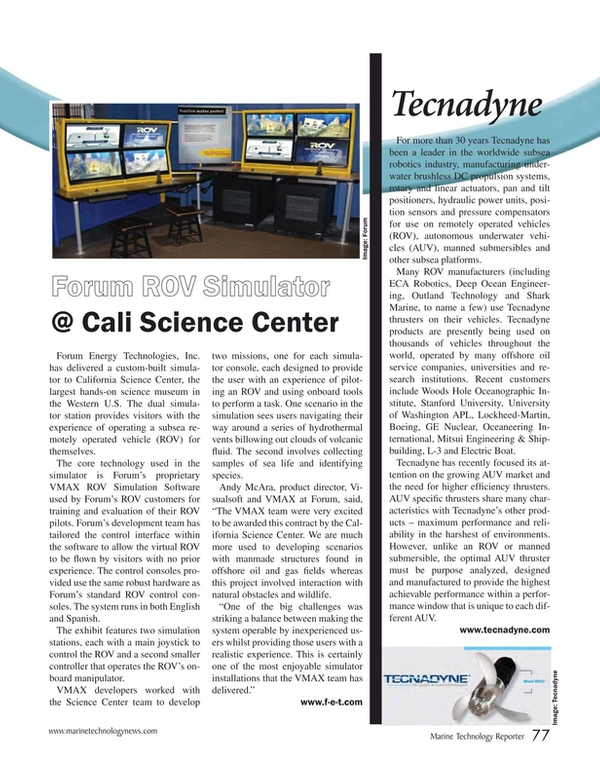 Tecnadyne has recently focused its attention on the growing AUV market and the need for higher efficiency thrusters. AUV specific thrusters share many characteristics with Tecnadyne’s other products – maximum performance and reliability in the harshest of environments. However, unlike an ROV or manned submersible, the optimal AUV thruster must be purpose analyzed, designed and manufactured to provide the highest achievable performance within a performance window that is unique to each different AUV.